A Prize for an Icy Moon Mission to Find Alien Life | FuturePrize | What Does the World Need? Most people are shocked to learn that there is a very real possibility that alien life exists within our own solar system. Surely if there was even the slightest chance of making such a profound discovery, NASA, the ESA, or one of the other space agencies would do everything that they could to bring about this important breakthrough? Well, the fact is that many governmental space agencies have put forth planned missions to explore the sub-surface oceans of Jupiter's moon Europa or Saturn's moon Enceladus - both of which scientists now theorize could support life - but frustratingly all of these missions have either been unapproved or cancelled for budgetary reasons. The Icy Moon Mission FuturePrize seeks to crowdfund a substantial cash prize to be awarded to any governmental space agency (NASA, ESA, RKA, JAXA, ISRO, CNSA) or qualified private group that will launch a mission to explore the sub-surface ocean of one of these moons. 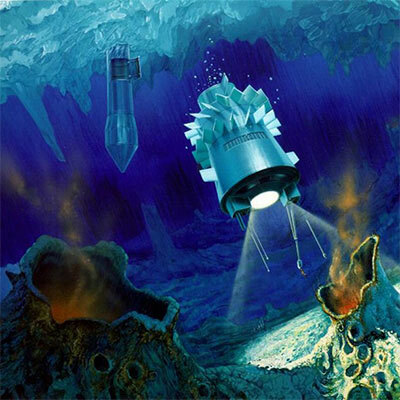 The winning team will put forth a detailed plan for how exactly they intend to land a robotic probe on either the surface of Enceladus or Europa, and then get that probe through the icy crust to the moon's sub-surface ocean, reporting back to earth with data and imagery that will hopefully confirm or disconfirm the presence of an alien biosphere. Beyond the core mission, applicants should also detail what additional scientific research or discoveries their proposed mission could offer the world. However, the most important goal for any proposed mission is to make absolutely certain that there is zero chance of contaminating any potential alien biosphere. The prize winning team must ensure that the probe will enter the sub-surface ocean in a completely sterile state. The winning team must also put forth a detailed mission budget, and provide proof of any additional funding from grants, government agencies, or private donations in the event that the prize amount alone will not cover the entire mission cost. The winning team will put forth a detailed plan for how they will land a robotic probe on the surface of Enceladus or Europa, explore the sub-surface ocean, and report back to earth with data and imagery that will confirm or disconfirm the presence of an alien biosphere. The winning team will detail additional scientific research or discoveries that could be realized from their proposed mission, beyond the core goal of the discovery of an alien biosphere. The winning team will put forth a detailed mission budget, and provide proof of any additional funding necessary if the prize amount will not cover the entire mission cost. Most importantly, the winning team must ensure that the probe will enter the sub-surface ocean in a completely sterile state, to make certain that there is zero chance of contaminating a potential alien biosphere. Pledge Now Note: You will only be charged if this prize is won. Note: You will only be charged if this prize is won.